While the HP Touchpad was a super good deal when it was $99 there are some issues. One issue I have come across is problems with the micro USB connector. Recently the HP Touchpad stopped charging. It didn’t seem like it could be the cable since it was new. I found one way to get the HP Touchpad to charge. 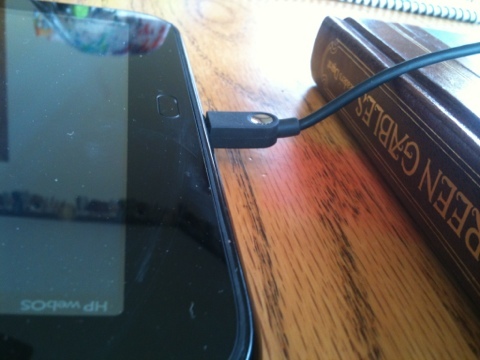 If you put an object like a book under the cable near the connector the HP Touchpad will charge. (see picture above) I usually do this at night so I don’t have to worry about someone moving it. At least there is an option to buy an inductive charger for the Touchpad.